This monthly account not only refers to the Eakring and Kersall areas back in 2004, but is still relevant and is intended as a rough guide only. The wildlife throughout the calendar year is varied and each year is never the same. In order to gauge what one might expect to see, it is always advisable to access up to date information from bird news services, via pager or telephone. Birds Often quite quiet in the area. Numbers of wildfowl have decreased in recent Winters as regular shooting takes place at Eakring Flash. "Safe ground" at Eakring Meadows does still usually hold good numbers of Teal throughout the early months of the year and Goosander are still fairly regular at Eakring Flash, especially if the weather turns colder. Pink-footed Geese may move north-west on fine, sunny days. Peregrine is often regular around the area along with several semi-resident Common Buzzards. Numbers of Snipe remain at Eakring Meadows, whilst Jack Snipe are usually present around the pool at Penny Pasture Common. Cold weather can induce numbers of Sky Lark, Lapwing and Golden Plover to move south-west, whilst more traditional Winter migrants such as Fieldfare are usually present in good numbers around any open fields. 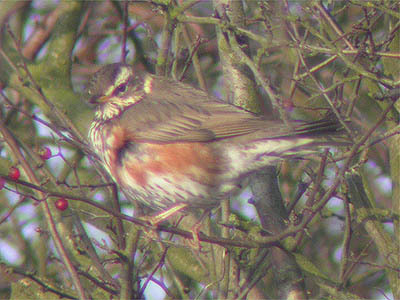 Redwing are rarely found in numbers here during the first few months of the year, but there are usually odd groups around Eakring village and Eakring Meadows. Butterflies Unlikely that any of the hibernating Nymphalids will be seen, unless found accidently in outhouses and garden sheds. Moths Several species are on the wing during mild nights in January, including Satellite, Chestnut, Pale Brindled Beauty and Tortricodes alternella. 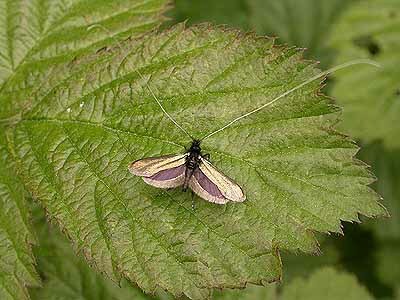 Spring Usher (pictured above) was added to the area's moth list in early 2005 and is possible again during late January. Dragonflies None on the wing. Birds Another very quiet month. Water Rails remain at Eakring Flash and Jack Snipe should be around Eakring Meadows. February is the most likely month to see Merlin here, with most records being of brief migrants. Stonechat has turned up in February and the first visible migration often occurs at the end of the month, when small numbers of finches and buntings move back north. Look around Alders for small groups of Siskin (feeding parties are quite uncommon here) and check set-aside fields for Tree Sparrows and a selection of finches and buntings, whose numbers are often augmented by passage birds. Butterflies In exceptional years such as 2003, some of the hibernating species will make early flights if the weather becomes unusually warm for the time of year. Moths February trapping sessions are dominated by good numbers of the micro Tortricodes alternella and larger macro species such as Pale Brindled Beauty, Spring Usher, Early Moth, Dotted Border, March Moth, Satellite and Chestnut. A few of the species more traditionally associated with March often emerge during the latter part of the month. The rare Red Sword Grass (above right) has also appeared here during February. It's still a much sought-after moth with lepidopterists over most of the southern half of the UK, but the species may be undergoing a population increase following records from many other counties during 2005. Birds A very varied month, with numerous rarity possibilities. A trickle of overhead migrants, gradually becomes a sometimes constant passage of birds in the right conditions. Meadow Pipit migration peaks during the third week of the month and provides a real highlight for the visible migration watcher after the quietness of Winter. Fieldfare numbers begin to build around traditional sites like Tug Bridge Farm, but Redwing are often found in far fewer numbers. The first returning Summer migrants will appear, with Wheatears being especially attracted to any bare, open fields and Sand Martins are usually brief at Eakring Flash. March has seen a host of scarce birds, with Bean Goose (1998) Red Kite, Hen Harrier, Goshawk, Whooper Swan and Common Crane. Regular waders include migrant Curlew and Green Sandpiper. Wildfowl numbers tend to build up at Eakring Flash and groups of Tufted Duck often arrive overnight. Shoveler and Goosander are likely. Butterflies March is usually the month for seeing the first butterflies, with Small Tortoiseshell, Peacock, Comma and Brimstone appearing on fine, warm days. Moths The range of species increases as the month progresses, but the Orthosias dominate and are usually very common visitors to the light trap. The Grey Shoulder-knot is increasing it's range in the county and has become quite regular in the area. Small, Common and Twin-spotted Quaker, Clouded Drab and Hebrew Character are likely, along with other early species like Satellite and Chestnut. Engrailed, Brindled Pug and Pale Brindled Beauty are also very easily attracted to light. Dragonflies Still none on the wing. Mammals March is a good time to look for Water Vole and other small mammals. Best area for them is along The Beck at Eakring Flash, where they are regularly seen from the footbridge at the northern-end. Brown Hares are also best observed during March, before the vegetation becomes too long and makes viewing difficult. They are common throughout the Eakring and Kersall area, but fields around Eakring Flash and Red Hill are especially favoured. Birds A month of two halves really, with the second half always being better. After the first flurry of Summer migrant arrivals in late March, Willow Warblers and Blackcaps arrive in small numbers from the first week of April. The month can often be an anti-climax initially, but persistance will pay off as waders, terns and numerous scarcer passerines move through the area. Most wader and tern records at Eakring Flash refer to brief fly-overs only, as water levels are never low enough in Spring to provide suitable feeding areas for waders and the water area itself, is too small to hold feeding terns. North-easterly winds and rain often produce the best results for the latter two groups, but much of the morning can be virtually birdless unless there is a major movement taking place. Species to look out for include Arctic Tern, Little Gull (on days of notable passage and NE winds) Greenshank, Bar-tailed Godwit, Redshank, Dunlin and Whimbrel. In conditions such as this, even the Eakring area will occasionally produce some exciting birding. The northern end of Eakring Flash is the best place to stand, but by venturing to other parts of the area, you are more likely to see Wheatears in open fields, Redstarts in the Hawthorns on Penny Pasture Common and warblers moving along hedgerows or singing in territories. April is also notable for raptor migration and Osprey and Marsh Harrier are both possible, whilst an early Hobby is likely almost anywhere. Visible migration will see hirundines, finches and pipits continue to move north. Ring Ouzel should be looked for almost anywhere here, with a series of records coming from a range of sites and habitats. Butterflies Butterflies having over-wintered as pupae emerge. Male Speckled Woods patrol shady areas along hedgerows and woodland glades, whilst Small, Large and Green-veined Whites will be in flight. Orange Tips (a sure sign of Spring) also emerge and in early years, Holly Blues will frequent gardens and hedgerows, but is a species subject to extreme variations in population levels due to parasitism. Moths The tiny micro Eriocrania subpurpurella is very common around Oaks and at light. One of April's specialities here is the scarce and beautifully marked Lunar Marbled Brown. One easy to see species is Diurnea fagella, in which the female is wingless. Both sexes are commonly found resting during the day on tree trunks . Water Carpet and Brindled Pug are common after dusk. Birds Waders and terns can still move through during May, but again weather conditions often have to be quite poor to get them here. Turnstone and Bar-tailed Godwit both appeared on very gloomy mornings in 2000, but Arctic Tern is now virtually annual. 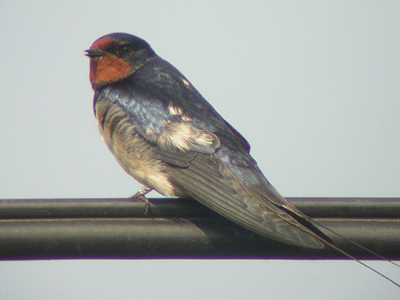 Summer migrants continue to arrive, with more concentrated Swallow and House Martin passage taking place during the first half of May. A recent (and quite unexpected) colonist to the area in 2005 was the Reed Warbler. Eakring Flash should again see birds returning again this year. Spotted Flycatcher also arrives late and migrants often pause briefly along the old hedge at Eakring Flash before continuing north. In favourable years, Quail have appeared twice in May and late evening visits to listen for them, may also be rewarded with views of hunting Barn and Long-eared Owls. 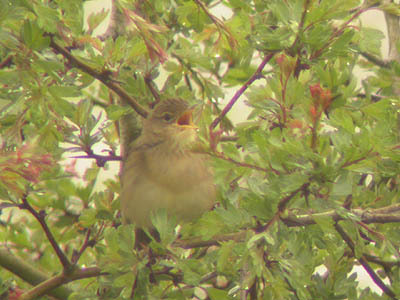 Grasshopper Warbler may be heard reeling from any rough patch of vegetation, with Eakring Flash the most likely. Butterflies The butterfly season really gets underway this month, with the first migrants usually appearing. Red Admirals and Painted Ladies often can be seen moving north over the fields, sometimes stopping to feed in flower-rich areas. Small Copper, Common Blue, Brown Argus and Wall Brown all emerge, but the Brown Argus is still a very hard species to find in the area. The grassy Mill Lane is perhaps the species' stronghold. Moths A large increase in the number of moths to be found on the wing, with the first Hawk-moths appearing. Green Carpet and Rivulet are very common in all habitats here, along with the sulphur-yellow Brimstone. May usually produces the first records of migrants like the Silver Y, whilst several other day-flying moths include the local Small Yellow Underwing, Mother Shipton, Adela reamurella (above right) and Adela rufimitrella. Dragonflies Usually none on the wing, but a warm month may trigger early emergences by Common Blue and Blue-tailed Damselflies by the end of the month. Birds Typically very quiet as the breeding season continues. Few parts of the area now resound to the purring of male Turtle Doves, and the best place to see them is around the Oil Bore Holes area of Eakring village. A fairly regular Nottinghamshire rarity here include Quail, which can again be listened for anywhere. If they arrived in May, they will continue to call throughout June. Best sites here for them have been the fields around Eakring Field Farm and Tug Bridge Farm. To be expected this month (but yet to occur) are non-breeding raptors like Osprey and Marsh Harrier which could pass over and Common Buzzards will never be too far away. Hobby is often regular in the Eakring Flash area hunting hirundines and dragonflies. Late passage waders such as Dunlin and Ringed Plover have been recorded moving north during the first few days of the month, but by the end of June, returning waders will be moving south again. Green Sandpiper and Curlew are virtually guaranteed during the final week. Sand Martin passage often peaks here in late June, which is also a good month here for Owls, with both Barn Owl and Long-eared Owl present in recent years. Butterflies June is notable for large numbers of Meadow Browns emerging. Other species on the wing this month include Large Skipper, Ringlet and Small Heath. Numbers of migrants may continue to arrive if weather conditions are suitable. 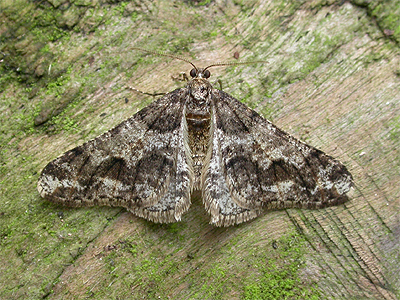 Moths Of the many species flying during June, one of the area's commonest is the Silver-ground Carpet. It's a species which is very easily disturbed from the vegetation during walks around the countryside and is easily attracted to light. Numbers of Rivulet and Brimstones are still about, whilst of the larger moths, both Elephant and Pine Hawk-moths fly. The Pine Hawk-moth is another fairly recent colonist in Nottinghamshire and since the first was trapped at Lound Wood in 2004, several other records have come and the species has been taken at light from the Red Hill area on a couple of occasions. Dragonflies Several species take to the wing during June. Species to look out for include, Black-tailed Skimmer, Common Blue, Large Red, Emerald and Blue-tailed Damselfies. The most easily identified species however, is the beautifully marked Banded Damoiselle. Birds Wader passage continues with Green Sandpiper and Greenshank the most regular species at Eakring Flash, but most records are largely fly-overs only unless the Summer has been dry. Whimbrel and especially Curlew are almost certain here. Small numbers of hirundines and warblers pass through the area. Grasshopper Warblers often turn up here in July, whilst hunting owls can also sometimes be seen. July often sees the first returning Whinchats favouring the rough vegetation at the southern end of Eakring Flash and occasionally Redstart appear early at Penny Pasture Common. Post-breeding flocks of Lapwing build up in open fields at Eakring Field Farm and Leyfields and finch flocks begin to increase as the month progresses. July produced the area's only record of Black-necked Grebe in 1999, but a more frequent passage scarcity is Common Tern, with July providing the bulk of the area's Autumn records. Butterflies Gatekeeper takes over from the Meadow Brown as the area's commonest butterfly. 20 years ago, this was one of several (now very common Notts butterflies) hardly known in the county and has spread enormously during that time. Both Red Admiral and Painted Lady may still turn up. The Essex Skipper was only recently found here and continues to colonise Nottinghamshire from the south-east. It's only known site here is along Mill Lane, but it is very hard to differentiate from the much commoner Small Skipper. Moths A huge range of moths fly during the warm July evenings and nights and a list of species likely to be seen is impractical here. Both Pine Hawk-moth and Elephant Hawk-moths are regular visitors to the light trap, whilst the area's only record of Small Elephant Hawk-moth came from Eakring Flash in 2003. Two very common micro moths found in any grassy areas, are the Grass Veneers, of which Agriphila straminella and Crambus pascuella are perhaps the commonest during July. 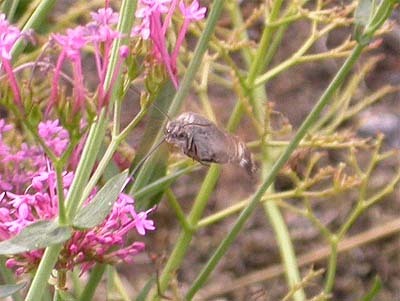 Large numbers of Mother of Pearl fly during the evening and are strongly attracted to the flowers of Rosebay Willowherb. They are readily disturbed from grasses at almost every step, but are quite difficult to separate in the field, unless the observer is experienced. More easily identifiable moths (and much bigger) are the Large and Lesser Yellow Underwings. Both come thudding into a light trap in good numbers and I have also seen Large Yellow Underwings during the late evening, flying around the tops of Oaks in large numbers, feeding on honeydew left by Aphids. Migrant moths are also worth looking out for - Silver Y's will be commonest, but rarer migrants could be found if warm southerly winds blow for any length of time. The Hummingbird Hawk-moth has also been recorded here during July and is now a species producing records on an almost annual basis in Nottinghamshire. Dragonflies New species to look out for during July are the larger Odonata. 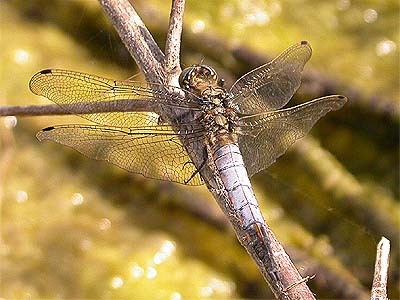 Commonest species are Common Darter and Ruddy Darter. Brown Hawkers occasionally appear along with Emperor Dragonfly. Birds A range of birds to look out for during August contains some very likely Eakring rarities. August also sees Teal arriving back into the area and rarer species such as Wigeon and Shoveler can be present - although these rarely linger. Two juvenile Garganey (in 1999 and 2002) have been the area's only records to date, whilst Marsh Harrier and Wood Sandpiper have both produced August records. Commoner waders will again be Greenshank and Green Sandpiper, with Common Sandpiper still being an unlikely area rarity. 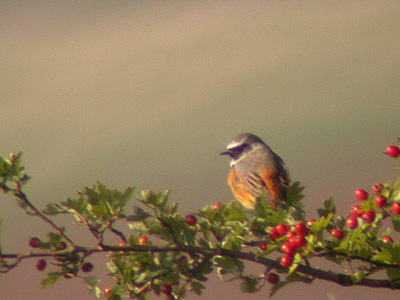 The Hawthorns on Penny Pasture Common should produce odd Redstarts, with Whinchats preferring the bordering fence. Wheatears should be looked for in any open situation around the farms. August sees migration continuing apace, and whilst never attaining the high numbers of the following two months, it does perhaps offer the best chance of seeing or hearing Tree Pipit. 2001 saw large numbers of birdwatchers visit the area to see the long-staying Spotted Crake at Eakring Flash, with records of Arctic Skua and Caspian Gull coming in 2004. Hobby are usually quite commonly sighted in the area, with occasional sightings of more than one bird. Butterflies Known from only one site here (Lound Wood) the Purple Hairstreak often appears during July, but is still on the wing well into August. Look for it around the tops of Oak and Ash trees at the entrance to the wood. This is easily viewed from the countryside walk which runs north from Eakring Flash. Migrants appear in greater numbers and will start to move south in increasing numbers. Both Painted Lady and Red Admiral will provide highest numbers, but Clouded Yellows are possible during good invasion years. Moths Another bumper month for moth enthusiasts, with many of July's species still in flight, but also more late Summer species coming onto the wing. The various underwings and veneers once more provide the greatest numbers at the light trap, but rarer moths to look out for include Magpie Moth. 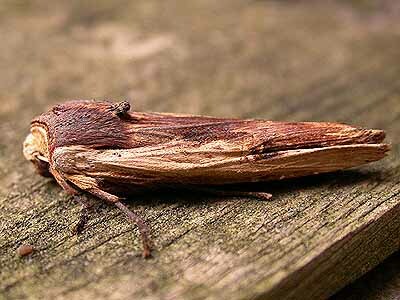 This is a species which produces occasional bumper years here, during which it can be one of the area's commonest moths. It is also a moth readily disturbed during the day, from hedgerows and similar vegatation. Another day-flyer is the Vapourer, although only the russet-brown males will be seen. The females are wingless and never move from their pupal cocoon, upon which a large batch of eggs are laid. Other common species found during August will include Common Rustic, Snout, Ruby Tiger, and Setaceous Hebrew Character, whilst the beautiful White Satin is rare Nottinghamshire moth. A good month for migrants with records of Dark Sword-grass, Hummingbird Hawk-moth and (most common) Silver Y.
Dragonflies Southern and Migrant Hawkers join the number of earlier emerging species still on the wing. The best area to look for most is around Eakring Flash, but Migrant Hawkers will often be found along the edges of Lound Wood and around mature hedgerows. Birds September is largely about migrants and visible migration - providing a month of contrasting species ranging from departing Summer migrants to the first returning Winter visitors. Meadow Pipit numbers peak during the third week and Tree Pipits will often be detected within groups of Meadow Pipits by their distinctive call. Hirundines and finches will also pass through in large numbers and when conditions are right, movements can last virtually all day. A high vantage point is best, with the Red Hill area, being an excellent one. Just as good is the open vista around Chruch Hill. Quite often, a good vismig day in September, will inevitably produce large raptors and previous Septembers have produced records of Honey Buzzard, Osprey, Marsh Harrier and Red Kite, along with increased numbers of Common Buzzard. Waders will often feature at Eakring Flash if water-levels remain low enough to allow some unvegetated shoreline. Green Sandpiper is regular and Greenshank occasional here in September, whilst there have been records of both Ruff and Bar-tailed Godwit. Past September rarities have included a Wryneck at Kersall in 1984 and a Richards Pipit at nearby Hare Hill Wood in 1998. Wigeon and Shoveler could again turn up at Eakring Flash and Wheatear, Whinchat and Redstart are extremely likely at favoured sites. Butterflies Common residents on the wing will include all the Whites, Speckled Wood and Small Tortoiseshells. Late Gatekeepers still frequent hedgerows and similar places, but September is often best for producing peak numbers of Red Admirals, most of which will be recorded moving south or south-west. Painted Ladies will join them and Clouded Yellow is again possible. Moths Although numbers of adults/species drop during September, there is still much of interest as late flying moths come on the wing and migrants are probably more likely than in any other month of the year. September has produced seven records of the day-flying Hummingbird Hawk-moth. Regular checks of patches of Valerian or Buddleia may pay dividends. Second brood Snouts are generally common around hedgerows, where good numbers of the common Angle Shades frequent. Two beautiful and largely yellow noctuids are Centre-barred Sallow and Pink-barred Sallow. Both can be attracted to light in the area during the month. Common Wainscot, Square-spot Rustic are two of the most common moths at the light trap during September, whilst a recent Nottinghamshire colonist (2003) that may be found on fences and tree trunks is the conspicuous Grey Shoulder-knot. Dragonflies Still most species in flight, but now in gradually decreasing numbers. Birds Visible migration will see peak arrivals of Winter thrushes and Starlings during October and occurrences of scarce birds such as Ring Ouzel and Stonechat, often coincide with large movements of common migrants. Passage Meadow Pipits and good numbers of finches will continue to pass over heading south and parties of Linnet, Redpoll and Siskin are fairly characteristic of a typical October vismig day. Both Twite and Rock Pipit produced annual October records during the late 1990's. Wildfowl may again include Wigeon and occasionally Pintail with increased numbers of Teal. Pink-footed Geese cross the county to Norfolk in the opposite direction during October and are frequent over Eakring Flash. Jack Snipe are likely to be at Eakring Meadows with numbers of Common Snipe. Past rarities have included Goldeneye (2000) Grey Plover in 2000 and 2002 and Kittiwake in 1998. 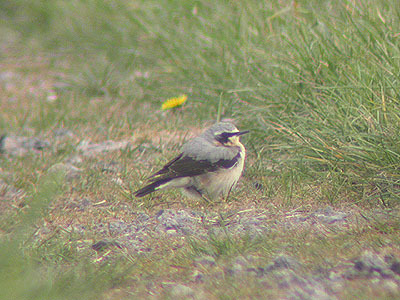 Virtually all of the area's Wood Lark records have come during October and have included one bird on the ground for a day, but perhaps the best records of recent years have been a Great Grey Shrike at Eakring Flash in 2004 and a brief Leach's Storm-petrel seen by two observers there in 2003. Butterflies Fewer butterflies will remain in flight during the month, but flowering Ivy is a magnet for late Red Admirals. Most of the Whites will still be recorded in decreasing numbers. Moths A large decrease in numbers of moths during October but some late Autumn moths are about, although this time of year has been rather neglected in terms of coverage. Feathered Thorn is one very likely species and probably the commonest moth found will be Angle Shades. Dragonflies Now becoming late in the season for dragonflies, but Common Darters still patrol their selected territories even well away from water. 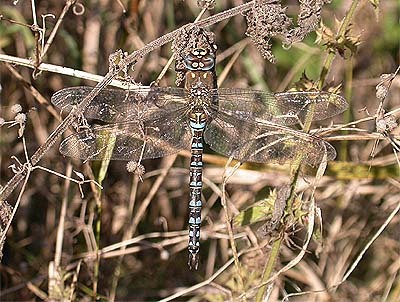 Migrant Hawkers are now the most frequently encountered species, especially along the old hedge at Eakring Flash. Birds Migration dominates the first week or so of the month, when it is still possible to get good movements of both Starling and Fieldfare. However, with visible migration tailing off by the middle of the month, November often sees the Eakring area become very quiet. Major rarities here though, have included two Lapland Bunting, White-fronted Goose (11 moving south-west in 2001) and Goosander are both regular Bewick's Swan (2001) and Goshawk (2004) Peregrine and Goosander are both regular vistors. Butterflies Seeing Red Admirals in November is becoming increasingly more common as the years pass and late migrants can appear anywhere. Pre-hibernating Small Tortoiseshells, Commas and Peacocks are also very likely on warm days. Moths Still quite a few late flying species flying on the more milder evenings, with November Moth, Winter Moth and Mottled Umber the most likely to be encountered. The males of all three are often noted flying after dusk and are attracted to most forms of light. There are however, a wider range of moths still in flight, but are more likely to be recorded by MV trapping. Dragonflies If the weather remains relatively mild, then odd Migrant Hawkers will remain in flight, with the occasional Common Darter present. Birds Usually very quiet and often the best Winter birding here follows falls of snow in the north and the east of the UK. This often signals the movement of large numbers of ground-feeding species. Skylark, Lapwing and Golden Plover are traditionally the main species involved in such movements, but thrushes and finches can also occur. 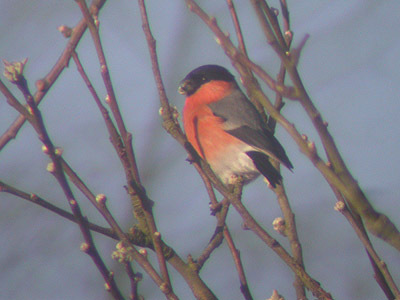 December will see build ups of finch and bunting flocks at any area's of set-aside. If remaining, the field near the old pump house, situated along the Kneesall road, often produces varying numbers of Tree Sparrow. Regular scarce species at Eakring Flash include Goosander, Peregrine and Water Rail. Jack Snipe should be found at Eakring Meadows, in with numbers of Common Snipe and Merlin could occur. Much rarer birds have been Goshawk (1998) and the long-staying family party of Bewick's Swan in Nov-Dec 2001. Butterflies Unlikely any will be seen during December. Moths Despite the much colder nights, there will still be some moths on the wing. Obviously these are fairly specialised species which have adapted over the years to fly on even the coldest nights, but it is quite surprising that I have netted adults in flight, even when the temperature was sub-zero. Of these, the most likely to be seen in car headlights or attracted to lighted windows, would be Mottled Umber and Winter Moth.